Our Table Cloth Crumbers are practical table cleaning tools that add professionalism to your bar, restaurant, or catering business. Waiters can quickly and easily scrape crumbs from the tablecloth prior to serving the next course. Each Table Cloth Scraper measures 6 inches long by 5/8 inches wide. The Crumbers are available with brushed metal or painted enamel finishes and gold or silver colored clips. 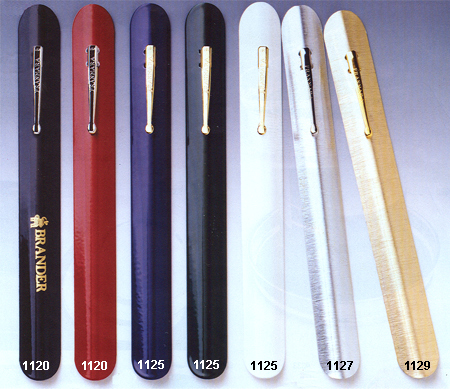 1120 Enamel Crumber with Nickel Plated Pocket Clip 1.45 1.41 1.33 1.25 2¾" 5/16"
1125 Enamel Crumber with Gold Plated Pocket Clip 1.47 1.43 1.35 1.27 2¾" 5/16"
1127 Brushed Aluminum Crumber with Nickel Plated Pocket Clip 1.47 1.43 1.35 1.27 2¾" 5/16"
1129 Brushed Gold Anodized Crumber with Gold Plated Pocket Clip 1.47 1.43 1.35 1.27 2¾" 5/16"
It's easy to get started with your Custom-Imprinted Table Crumbers - simply call 1-800-233-0828, and then e-mail your camera-ready artwork to graphics@kardwell.com (you can also mail your design). The minimum order is 100 scrapers. For additional information on our Table Cloth Crumbers or any of our other Bar, Nightclub, Restaurant, & Catering Supplies, please contact us at 1-800-233-0828.